This is your challenge to dream. This is your call to aim for something higher than you ever dared to reach. This is your reminder that you were meant for so much more than the shallow existence so many others are willing to passively embrace. Others. Not you. No, you’re so much braver than that. You aren’t going to waste your potential. What’s the craziest thing you’ve ever thought to do with your life? What’s that one thing that gets your heart racing just to think of it? Did you ever think that maybe it excites you for a reason? Did you ever dare to consider that maybe you were meant to pursue that dream? I don’t care how crazy it sounds. I don’t care who told you that you could never do it. All I want to know is if you ever considered that your big, crazy, seemingly-unattainable dream was God-breathed. Because if it is, it’s not unattainable after all. I believe that you could achieve so much more than you dare to attempt. I believe that you were meant for so much more than the life you’ve been living. I believe that you have a dream that was meant for more than just dreaming. 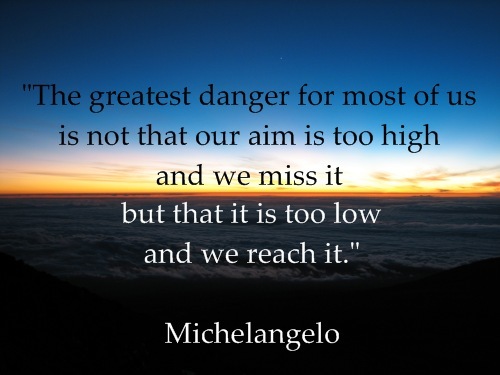 The danger is not in aiming too high; it’s in aiming too low. So dream, dear friend, dream. But don’t just dream. Do. ← Don’t You Know Anything?